I've been a big fan of Amy's sketches on SNL and Parks and Recreation so when I saw she wrote a book, I knew I had to read it. She doesn't disappoint. She writes in a very conversational tone to the point that I can imagine her saying the words out loud. I loved hearing about her start in comedy in Chicago as well as her hilarious life anecdotes. This would make a great gift for the people in your life hat make you laugh. I bought this book because I've seen it recommended several times and it was on sale on my Kindle. I tend to like WE II historical fiction so I figured I would like this too. To be honest, I'm still processing the characters. The entire story is a dichotomy between a young engineer in Germany and a blind girl in France. What they both endured was horrific and it gave great perspective on how different and the same such a terrible war was. 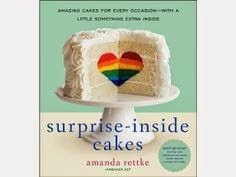 I follow i am baker and she recently posted that her cookbook was on sale on Kindle for $1.99 (do you see a theme? If anyone wants to give me a gift, an Amazon gift card would be greatly appreciated). I've seen pictures of her elaborate cakes and I was curious to see how she made them. The cookbook is full of adorable recipes that all contain a little surprise. Amanda gives great instruction and helpful pictures to explain her baking process. In hoping to make the Vintage Cake or New Years cake soon.